Shopbop has long been one of my favourite online retailers for its eclectic and extensive selection, from well-known designers to up-and-coming labels and mainstream brands (ahem, Madewell). A Shopbop spree can cost a pretty penny, but there's good news for girls on a budget: They're having their friends and family sale right now with 25% almost everything! Just use the code FAMILY25 at checkout. Better hurry though because it ends tonight! Sales like these are a great opportunity to nab an investment purchase that'll instantly make any outfit better. 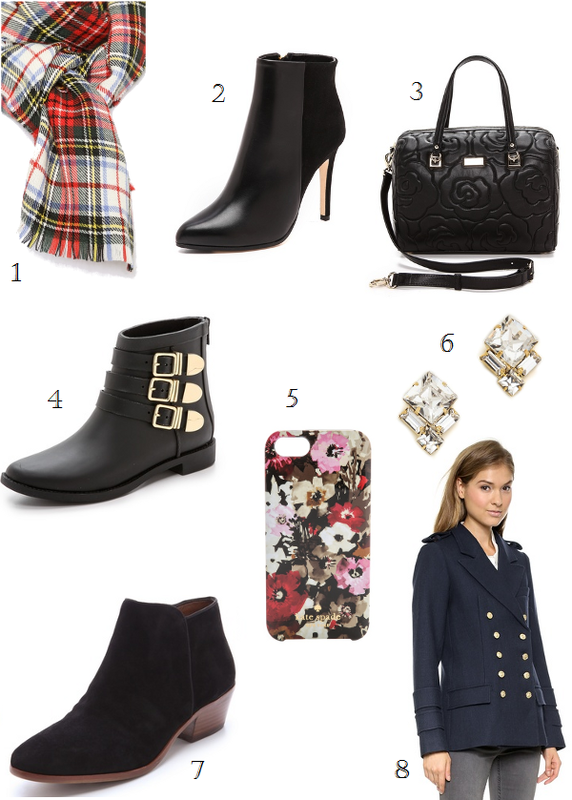 To get you started, I've rounded up a few picks based on my own closet essentials. Happy shopping! 1. A cozy wool plaid scarf to add visual interest to blazers, coats, and trenches. 2. Black stiletto booties to dress up a variety of nighttime looks from jeans to cocktail dresses. 3. A black satchel roomy enough for daytime essentials and fancy enough for date night. Plus, the rose-embossed lambskin reminds me of my camellia-embossed Chanel WOC. 4. Unique rain boots that will net you compliments every time you sport them, which in Vancouver would be very often. 5. A new case to perk up your existing phone (because you're not ready for the iPhone 6 just yet). 6. Sparkly studs to add a touch of luxe to sweater-and-skinny-denim combos. 7. Low-heeled ankle boots you can wear comfortably all day long. 8. A classic coat that'll keep you looking polished no matter how cold it gets.